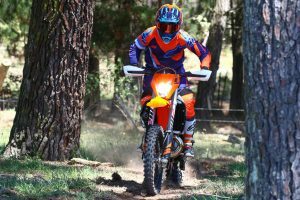 MotoOnline.com.au tests the 2018 KTM 300 and 250 EXC models. 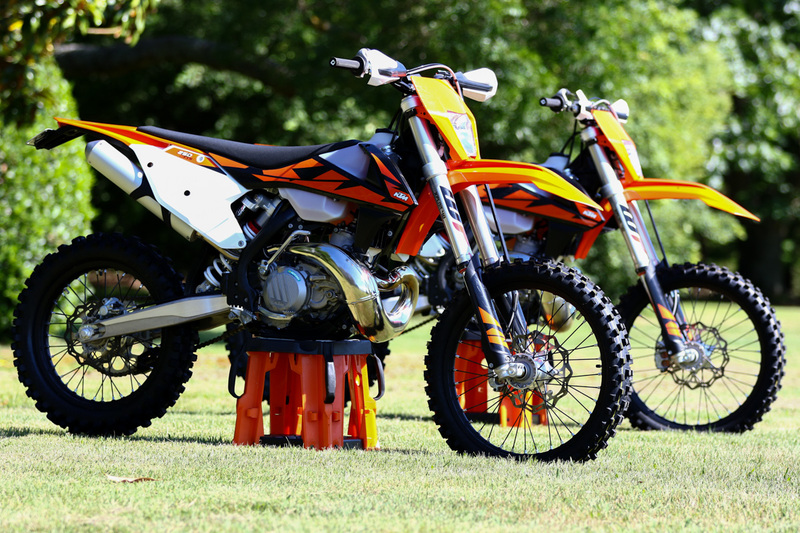 As far as KTM is concerned, two-strokes are sticking around, that is for sure. The Austrian brand has gone to extreme lengths by introducing its fuel-injected variants for 2018, however they have retained the carbureted 300 EXC and 250 EXC models as well. 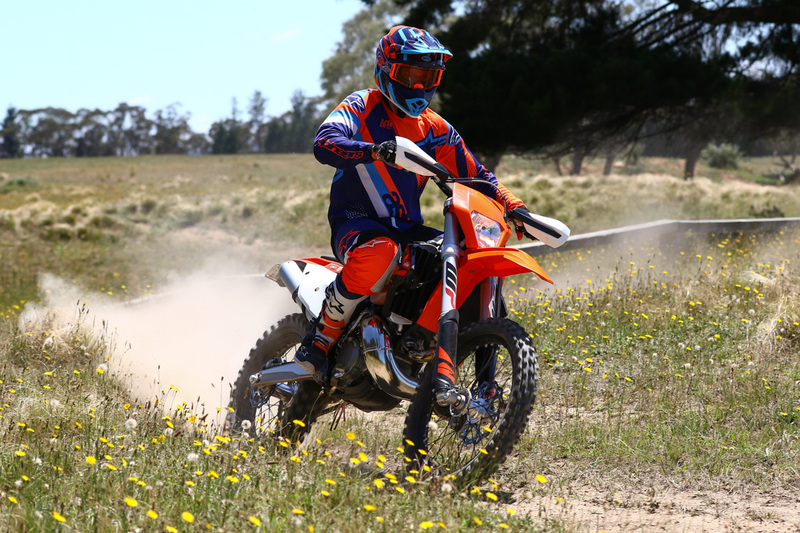 We all know the beauty of owning a two-stroke is that it is a relatively simple engine that you can work on yourself without too many dramas, which for some people is part of the love of owning an off-road motorcycle. The standard model may have taken a back-seat to the TPI model for this year, but it shouldn’t be overlooked and it’s not behind in any other way, aside from the way the fuel and oil is transferred to the motor. In fact, these bikes are three kilograms lighter than the TPI editions, which is worth taking into consideration. KTM’s 250 EXC has been long-regarded as the strongest motor on the market in class, while the 300 EXC is exactly what you want from a big-bore two-stroke, boasting plenty of grunt down low and more than enough top-end to be excited about. We were fortunate enough to get invited to a small farm on the outskirts of the Belanglo State Forest, just south of Sydney, under the watchful eye of the KTM Enduro Racing Team manager Glenn Kearney. The location itself had a really cool grass track with all the usuals – long ruts, berms, a few small jumps and plenty of room to get the bikes moving. Just down the road was an epic pine forest with endless possibilities of trail combinations, rocky ledges and some awesome single-trail. 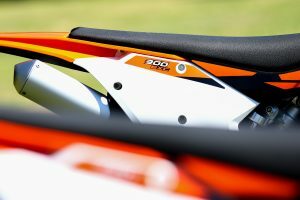 For 2018 there is not much new or anything significant for either of the 300 or 250 EXC models. 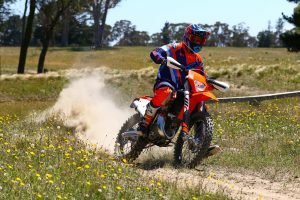 KTM has focused on sharpening the handling through revised suspension settings though, since WP has improved upon the previous settings, adding a hydro-stop and adding stiffer outer fork tubes, which were adopted from the latest SX models. 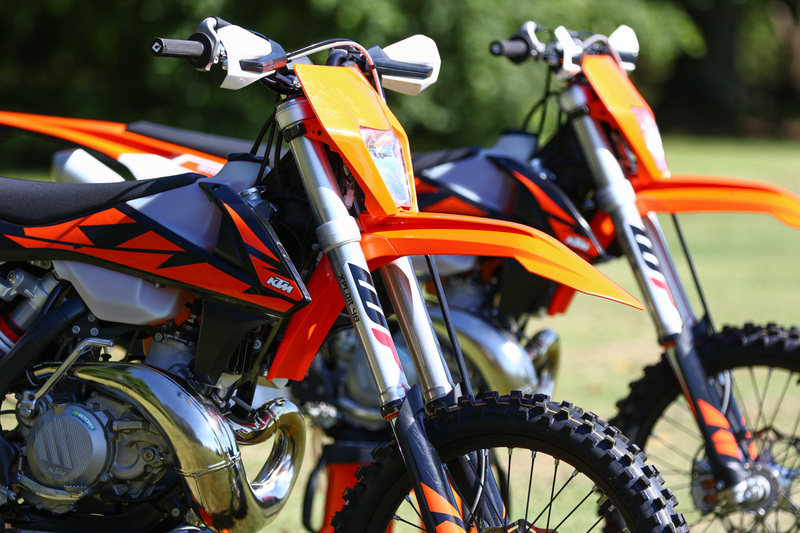 In addition, KTM’s improved the radiator protectors to increase air flow and cooling, which also improves the ability to withstand damage in falls. The CDI control unit has been adjusted, improving the starting behaviour, however the ignition curves remained unchanged from the 2017 settings. If you are not familiar with the current KTM 300 and 250 EXC’s features, then we better step through them as they have plenty of great qualities and both are outstanding in their respective categories. They’re essentially the same bike with different sized capacities. 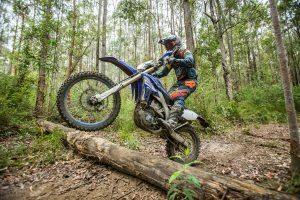 Last year they were all-new from the ground up, with more horsepower, less weight and better handling than the previous evolution of the two bikes. 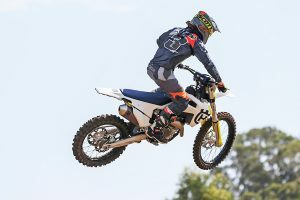 The appearance and plastics were fresh and more functional than ever before, the air-box was redesigned, fuel-line connecter improved, joined speedometer and front brake cables, ODI Lock-on grips fitted, No-dirt foot-pegs and shift-lever utilised, which is all the latest in top-level KTM tech. Add in the Brembo brakes, hydraulic clutch and all the usual strengths we’ve come accustomed to in the EXC line, these are impressive kits. Both compact and modern, a counter-balance shaft introduced in the two-stroke range significantly reduces vibration. 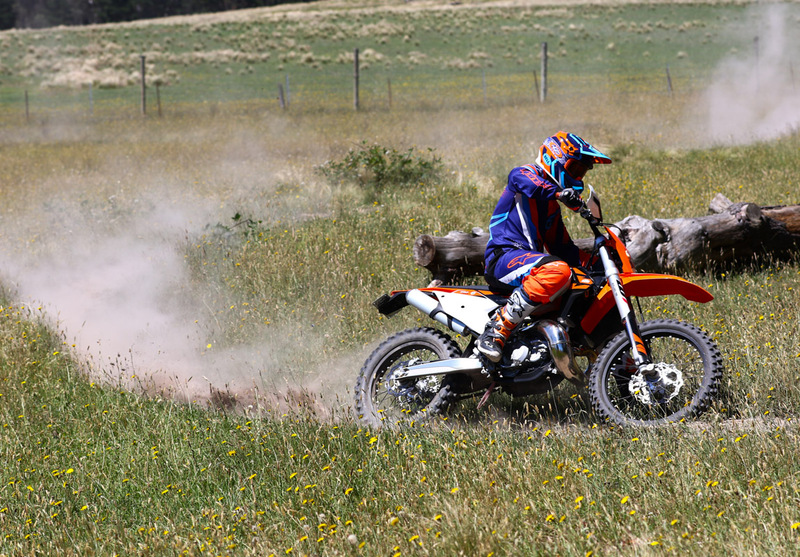 It’s an aspect that you don’t really appreciate until riding different two-stroke equivalents back-to-back. Both the 300 and 250 EXC boast more horsepower than the older generation bikes and the way the power is delivered is smoother and more useable than ever, which makes it less fatiguing. 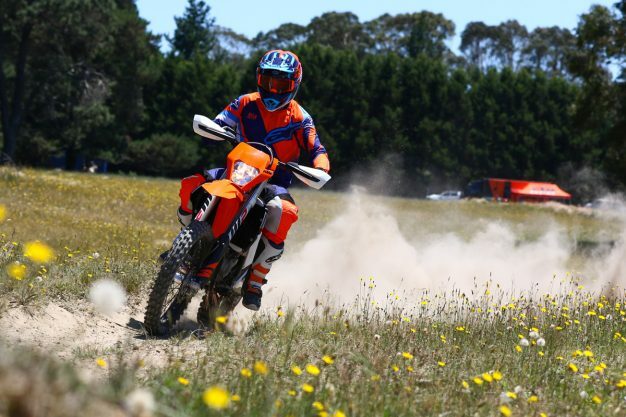 KTM uses a 38mm Mikuni TMX carburettor, which makes the power delivery even more controllable by a different flatside design over the previous Keihin carburettor that was used in the past. It has also improved jetting at different altitudes and temperatures, becoming more consistent as well. The EXCs are both electric and kick-start, with the Lithium-ion battery 1.1kg lighter than the older battery. 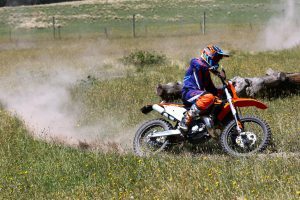 Getting the power to the ground is through a six-speed transmission, which is well-suited to enduro riding and the bikes’ power. The 300 EXC motor is magic! It has so much torque down low and plenty to lug around in a gear taller than you otherwise would. Plus, it keeps pulling all the way through to the top-end. There is something about the 300 EXC motor that just inspires a little too much confidence, considering its capacity. The power – there is a lot of it – rolls on fairly smoothly, in a more energy-saving way in comparison to other makes, but that is not to mean it’s lacking, it just feels more user-friendly. 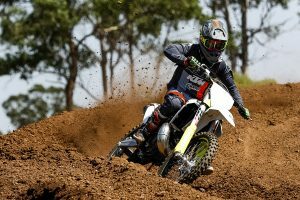 The lack of vibration is really evident jumping between brands and it’s a factor that gives you better feel of the bike overall. 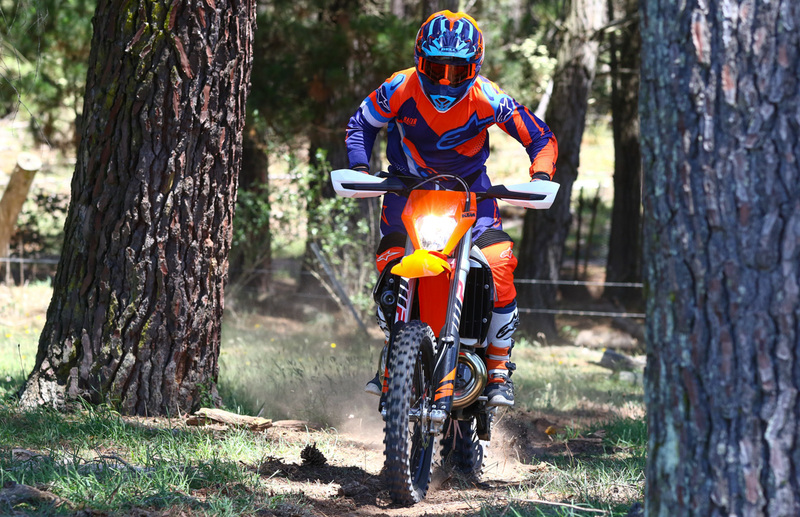 The 250 EXC motor has been class-leader for a long time – strong, reliable and fast. It is strong right off the bottom and there is no getting used to this weapon at all, because you just have to rev it, keep shifting gears and you’ll find comfort. It’s a blast to ride and it’s light! Redesigning the entire bike from the ground up has allowed KTM to start with a frame that could fit a smaller, more compact motor and then centralise its mass to provide sharper handling and an improved centre of gravity. The Chrome-moly steel frame has been made stiffer from side-to-side, which gives the bike more precise cornering characteristics and offers better rider feedback. The frame has been made more flexible front-to-back, allowing it to work better with the suspension and help aid rider fatigue. The swing-arm mount for the PDS suspension has been shifted inward, which provides greater performance with a more symmetrical feel. The foot-pegs have been raised by six millimetres to allow for better ground-clearance. The WP XPlor 48mm fork has 300mm of travel, sporting rider-friendly ‘on-the-fly’ adjusters on the top of each fork tube. KTM has been long-recognised for the PDS rear suspension, which these continue to use. The suspension for both models is exceptional. 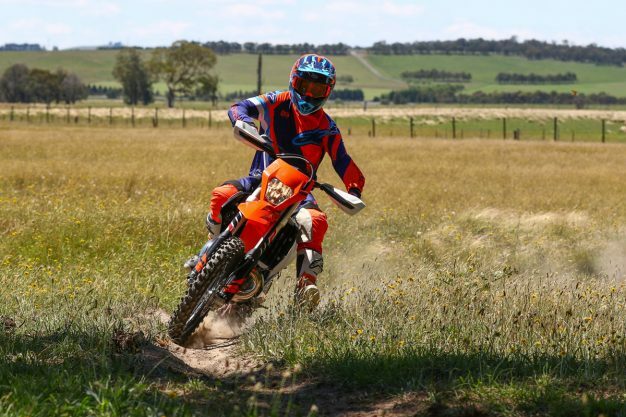 The handling of the fork is great, with a nice feel over small, sharp, rocky terrain with no sneaky surprises. It’s forgiving and stable on the faster and rougher terrain, so all-round you’ll be impressed in my opinion. The 300 EXC really changes directions well and is well-balanced, as is the 250 EXC. But with the smaller engine capacity, it falls into ruts easier and corners slightly better. Something both bikes share is the way they feel when you are on them, because throw them on a static stand and jump on, they both feel very good. The Neken handlebars can be adjusted in four different positions on the triple clamps to suit individual preferences. They’re extremely capable bikes that are just as versatile in their usage. 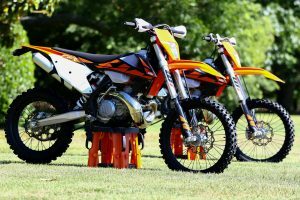 There is not a lot to change or want more from either the KTM 300 EXC or 250 EXC. A few aftermarket accessories wouldn’t go astray like the KTM PowerParts pre-load adjuster and maybe a bash-plate, but in my experience these are truly impressive from the showroom. When you look at the basics, they are lighter, stronger and have plenty of horsepower. Most people who choose a two-stroke do so out of passion for a variety of reasons and it is good to see a company that shares that. In summary, it’s the little things that really help complete these bikes and make for a first-class package, so at $1000 cheaper than the new TPI versions, you’ll be getting plenty of bang for your buck.